Real talk? Teaching is a challenge. It’s chaotic, overwhelming, stressful. It doesn’t just require hard work; it requires heart work. I think my fellow teachers know exactly what I mean. We love our kids. I mean, we call them “our kids,” after all! We worry about their progress in the classroom. And then we worry about them some more when they leave the safe confines of the school. We keep extra snacks in our desk drawers for those children whose only meals happen at school. We comfort students when they cry, and we celebrate their successes, inside and outside the classroom. We help them learn to believe in themselves. And we let “our kids” know we’ll be rooting for them long after they’ve left our classrooms. Because isn’t that really what every teacher wants? To know that these kids we shepherded through their school days have turned into kind, compassionate adults who are making this world a better place? One of my former students, Ali, is doing just that. As many of you know, I often reach out via social media with pleas for help when I’ve learned of someone in need. Sometimes it’s a former student who’s experiencing hard times. And in many cases, it’s to advocate for an abused or abandoned animal. And Ali? She’s always quick to step up and help in whatever way she can. When a former student was having a tough time finding shelter and general household and personal supplies, Ali reached out and offered bath towels. When I post about animals in need of loving homes, she responds to the post with support and an offer of assistance. It seems that some of the “heart work” I’d done had made an impact! Like every teacher, I wanted my students to do well in their academic subjects. But more than anything, I wanted them to be good at life. I wanted each and every one of my kids to leave the classroom believing that who they are MATTERS. And to never lose that belief. When I read Ali’s message, I thought of all the times I felt like I struggled as a teacher. When I rocked at teaching math, but allowed my writing lessons to slip. When I fired up my writing lessons, but didn’t give science enough attention. I realize now that my most important job was to love my students and teach them real life lessons. And in those subjects? I succeeded! 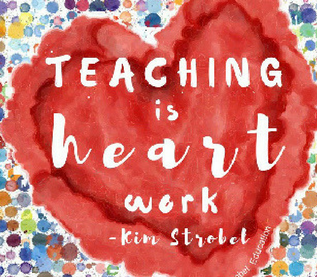 My friend and fellow teacher, Jed Dearbury says, “Love First, Teach Second.” Do that, and you’ll give kids the tools they need to turn into kind, compassionate, happy adults who will do great things! Question: What’s your favorite “success story” you’ve heard from a former student? Comment below. One of my favorite stories is about a young man I had last year. Each day as students entered my math class, I would say, “Welcome to Success!” Keynen was very bright and quite frankly, I did not think I had anything to teach him. He knew his math very well and often challenged me with questions that would stretch him a little more each day. At the end of the year, his ELA teacher gave them the assignment to write a thank you note to a teacher. Keynen wrote me and thanked me for my daily invitation to success. He said he had learned more from my life lessons when other students didn’t want to learn or didn’t complete assignments. (I tend to show them how that looks in the real world), and then he wrote, “I know you were not just spouting off words to us because when you said “Welcome to Success” you meant it and gave us all you had every single day! –A big wow for me because I felt like I had struggled ALL YEAR LONG and didn’t have much to offer–especially the “Can Do” kids. I let him know how his note blessed me. PS Sorry I didn’t get to attend your PD this week. I asked, but it was not granted to me, although 2 others went. They told me how awesome you were with Growth Mindset! Keep up the fight! Oh my goodness. I love this story, Lynne! And “Welcome to Success” is a wonderful way to greet them. Thank you for sharing this heartwarming story!